Homeowners painting walls have long struggled with finding a way to paint tight edges around trim moldings accurately and without a mess. The technique is called "cutting in," and it's the step that normally precedes rolling the large surfaces of the wall with a paint roller. A few DIYers can manage the skill of cutting in freehand with a tapered trim brush, but most of us aren't that skilled and need some sort of device or technique for cutting in. That's why so many of us now cover the edges of trim moldings with painters tape so we can brushstroke the wall paint right up to the woodwork. Using painter's tape is time-consuming, though, and the results are mixed, so we are generally ready to try new solutions. Over the years, manufacturers of painting accessories have created all manner of devices to make cutting in around trimwork easier. Some of the solutions, like painters tape, are successful enough to have found niche markets and long-term acceptance. Others have come and fallen by the wayside in the same way the Edsel fell from grace in the consumer automobile industry. 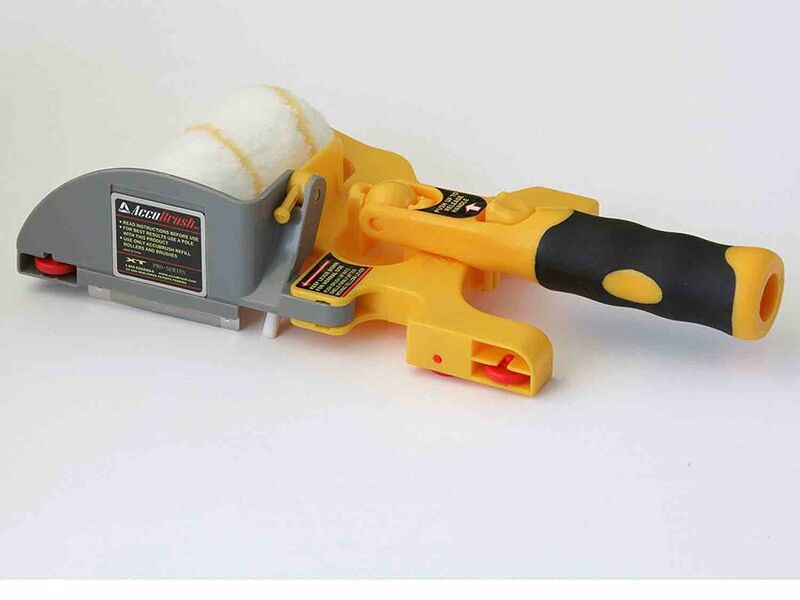 One such device that promises to help painters accurately cut in around wall edges and trim moldings is an invention called the Accubrush. The Accubrush purports to make painter's tape unnecessary. Essentially, the device is a narrow paint roller with a built-in plastic shield that is supposed to run along the edge of a window or door frame, protecting the surface while the paint roller applies paint right up to the edge. The "secret" to the device is a tiny secondary paintbrush with nylon bristles that is integrated into the tool beneath the sheild. This tiny paintbrush follows behind the roller cover and is supposed to spread paint precisely up to the edge of the trim. That's the essence of the device, and when you buy the device in the MX kit, you get the roller handle device along with four replacement roller covers and four replacement paintbrush attachments. In the upgraded XT kit, you receive the same materials as the MX kit, but also receive a specialty roller handle that can be connected to an extension handle for painting ceilings or high wall areas. Yet another kit is available, the MX XT, which offers all of the above, plus a plastic roller tray. Prices typically range from about $40 for the MX to $125 for the MX XT. A variety of online videos are available showing how this device is supposed to work in practice. In tests with the Accubrush, we initially feared that the tool would overpaint onto the surfaces we were trying to protect. This is often the drawback of foam paint pads and other devices designed for edging. In fact, exactly the opposite was true with the Accubrush. There was no spillover of paint onto the "no-paint" zone, but the tiny nylon brush that follows the roller tended to spread the paint too thinly, leaving a narrow bead where the paint did not cover as fully as did the roller cover. The underlying wall color tended to show through along this narrow bead where the nylon brush touched the wall. This problem continued even with repeated passes of the tool. The only solution was to wait for the paint to dry, then to recoat once or even twice more, until the paint bead covered fully, right up to the edge of the trim molding or "no-paint zone." Still, this tool works better than foam pads and did not spill paint over onto trim work. And it is somewhat easier to use than painstakingly masking off the edges of woodwork with painter's tape. If you don't care about perfection with your paint jobs, you may find that the Accubrush does a "good enough" job. And if you plan to apply two or more coats of paint anyway, the tool may cover completely on the second or third coat. This is a true paint roller, not a foam painting pad. The Accubrush has an easy-grip rubber handle. Built-in brush follows roller to make for a smooth, neat line. Roller covers are easy to attach and replace. Nylon brush meant to create the edge does not lay down a thick-enough paint line. This is a somewhat expensive tool. In the final measure, this tool's performance limitations exceed its advantages for most DIY painters. On-line reviews of the tool concur, with negative reviews slightly outpacing positive ones. In addition to the problem with the nylon brush failing to completely cover the wall edge, some users have noted that the roller cover's long nap tends to cause paint to drip beneath the tool's shield, creating a mess. Unless you are willing to live with slightly sloppy edges, most users will likely find that applying painter's tape and cutting in by hand is a superior method.